The rot in the tobacco industry goes much deeper than the shocking claims of R7 billion per year tax evasion that one part of the industry levelled against another this week. While claims of an exponentially growing illicit cigarette market are believable, it is only part of the picture, says former SA Revenue Service (Sars) investigator Johann van Loggerenberg, who spearheaded attempts to clamp down on tobacco tax dodging before getting forced out of Sars in 2015. Van Loggerenberg released a book this week that reveals details around several high-profile cases at Sars during his 16 years at the entity, including the tobacco battles Sars got embroiled in. Van Loggerenberg told City Press that the attacks on him and other Sars officials in 2014 and 2015 were driven by cigarette money. “The initial attacks on me and others at Sars came from people associated with the tobacco industry. They [the tobacco industry] realised we had the goods on them and they needed to derail us. It may be so that other people jumped on the bandwagon, but the initial attack stemmed from people in tobacco who feared us,” said Van Loggerenberg. In his book, Van Loggerenberg recalls how one Sars investigator looking into the tobacco industry had been shot in his driveway. He also tells of receiving a letter from an attorney warning him that members of state intelligence agencies and the Hawks were “looking for dirt” on him. The people going after him were part of a multiagency tobacco task team who were implicated in corruption, racketeering and money laundering, claims Van Loggerenberg in his book. Van Loggerenberg’s own fall from grace was largely due to a former state security agent Belinda Walter, who also worked for the tobacco industry. She had a romantic relationship with Van Loggerenberg, but subsequently made far-reaching allegations against him. When Van Loggerenberg left Sars in 2015, a tobacco investigation called Project Honey Badger was culminating in 15 different criminal cases against tobacco manufacturers and importers that should have netted the fiscus R3 billion in the 2014/15 financial year. He claims that his sources in the tobacco industry have indicated that these cases largely died quiet deaths after 2015 when he left Sars and the investigative units he was involved in were disbanded. “I can only conclude that these cases were politically laden and sensitive,” writes Van Loggerenberg. He points out that, in 2014, before he and many other top officials were forced out, Sars’ efforts in the tobacco industry caused tobacco taxes to soar 25% in a single year. Since then, tobacco taxes have fallen back to the pre-2014 level. Van Loggerenberg’s book reveals more strange twists in the saga of the illicit tobacco trade. According to him, infamous “fixer” and now convicted criminal Glen Agliotti approached him in 2016, after he left Sars, to set up a new tobacco smuggling operation. Van Loggerenberg claims he recorded the conversation in which Agliotti proposed that Van Loggerenberg be the “face” of a new cigarette manufacturer, which would really be a front for smuggled cigarettes. Van Loggerenberg also claims to have recordings of meetings in 2013 between Agliotti and, among other people, Yusuf Kajee, the owner of Amalgamated Tobacco Manufacturers, which is one of the companies accused of major tax fraud this week. Transcripts of this recording are included in the book, where Agliotti proposed a “harebrained” scheme to create a cigarette smuggling network with the supposed blessing of the presidency to force all the other smugglers out of business. Agliotti also seemed to be trying to convince Kajee that Sars had damning evidence against him and that he should let Agliotti negotiate with Van Loggerenberg – seemingly with an eye to bribing him. All these recordings have been provided to law enforcement agencies, but no action has been taken, wrote Van Loggerenberg. The major multinational tobacco companies operating in South Africa, organised under the umbrella of the Tobacco Institute of Southern Africa (Tisa), on Thursday accused smaller local peers of conducting R5 billion in illegal cigarette sales per year, and effectively dodging annual excise taxes and VAT of almost R7 billion in the process. The research claimed that about 26.8% of all cigarettes sold in South Africa were “illicit” and that this trade was dominated by one local company: Gold Leaf Tobacco. 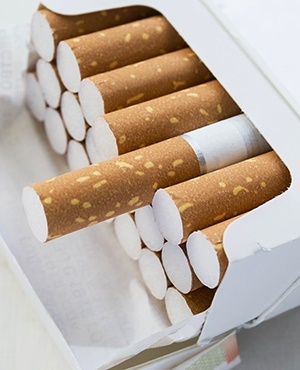 By “illicit”, the report means cigarettes sold for less than R17.85 per pack of 20 – the sin tax and VAT payable on such a pack. The argument is that if cigarettes are sold for less than the tax they pay, then the tax was almost certainly not paid. International research firm Ipsos was commissioned to compile the report, and it “may very well be well-founded”, Van Loggerenberg told City Press this week. At the same time, the problem focuses on only a part of the tobacco problem, he said. “The industry is complex. The manifestations of malfeasance cannot be limited to smuggling and under declaration. “There is a whole other side to that problem that is not in that picture,” he said. The Tisa report estimates the illicit trade at 8 billion cigarettes a year, equivalent to 400 million packs of 20. According to the Tisa report, Gold Leaf accounts for 75% of the entire illicit cigarette trade. Most of these are the RG brand that Gold Leaf produces. Gold Leaf operates out of buildings in Johannesburg’s Linbro Park light industrial area and proudly displays its brands on the outside of its building’s walls. Its directors are Johannesburg-based Ebrahim Ahmed Adamjee and Zimbabwean Simon George Wilburn Rudland. Gold Leaf fired back on Friday, accusing the major Tisa player, British American Tobacco, of being the real villain. In its statement, Gold Leaf said that it was British American Tobacco that had been implicated in Sars’ Project Honey Badger. It accused British American Tobacco of trying to squash a growing competitor by any means possible, including by using misinformation campaigns. “We emphatically deny being involved in any tax evasive practices whatsoever and rubbish all allegations levelled against us in this regard,” the company said this week. Gold Leaf questioned the methodology of the research and also claims that it paid excise taxes of R1.37 billion last year, which would not be possible if the majority of its products did not pay the tax. Gold Leaf accuses British American Tobacco of large-scale industrial espionage between 2013 and 2015 via the contractor Forensic Security Services, which, said Gold Leaf, spied on members of the Fair-trade Independent Tobacco Association and other small producers. Tisa does not deny Forensic Security Services worked for it, but does deny it did anything illegal. “Hiring firms to do market research is not unique,” Tisa CEO Francois van der Merwe said at a press conference on Thursday. “Obviously, we have a vested interest,” Van der Merwe added. He told City Press that the decision to actually name competitors they accuse of tax evasion was a controversial one, but that he was certain the research was good enough to stand up in court. Asked if he would sue Tisa for defamation, Gold Leaf director Adamjee said “probably”. In Tisa’s version, the major tobacco companies and Sars had a great relationship until Tom Moyane was appointed as Sars commissioner in 2014. Tisa claims illicit cigarette sales skyrocketed after Moyane’s appointment because Sars decided to stop factory inspections. “Some companies received political cover ... something happened, someone gave an instruction,” Adamjee said. He invited Sars to post custom officials at all cigarette factories to prevent undeclared cigarettes from entering the market.